Yorktown – Let's Go RVing! Since the kids weren’t coming in until later tonight we decided to use today for touring Yorktown. Yorktown per se is one strip down the center of town with the historic on one end and the beach and beachy things on one end. Quite a contrast. We easily found parking and first visited the Waterman’s Museum, where the mission of Chesapeake Bay Watermen, from pre-colonial to modern times is demonstrated. Waterman is a term used only in this part of Virginia and one other place and refers to people who make their living on the water, i.e. shrimpers, crabbers, etc. I, of course, immediately though it could apply to the many folks at Pamlico Beach that do the same thing. It also refers to those who operate tugs, ferries, and barges, in essence anyone who makes their living on the water in any way. We got an introduction from the docent and then the rest of the tour was self-guided with displays with written explanations- a lot of reading but it was interesting. We were fortunate to be able to observe a guy making miniature ships. That surely is a meticulous endeavor, one I don’t think I’d be interested in although the finish product is quite nice. The floor and the walls are made of Burled Long-Leaf Pine which grows along the Atlantic Coastal Plain from Virginia to Texas and they were one of the most impressive things there! 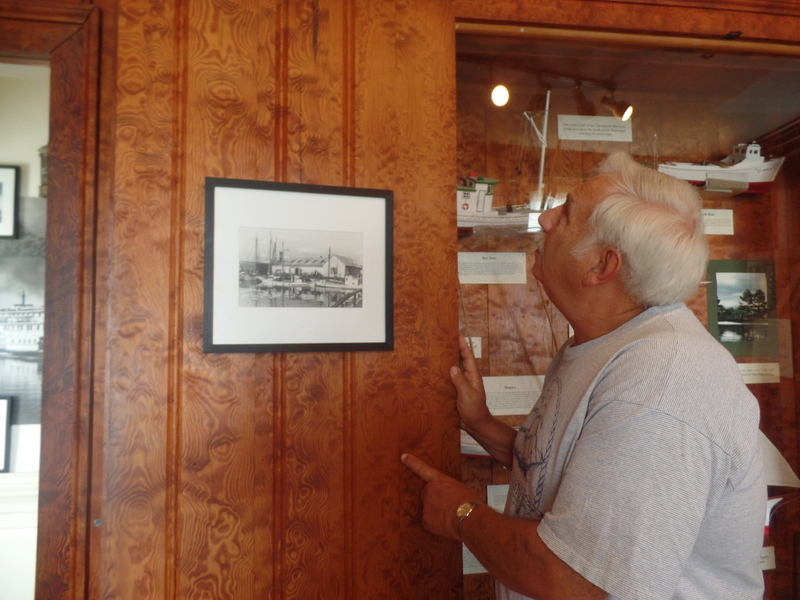 Of course Jerry noticed them and was amazed by the intricacies. The wood on the floor of the museum is most likely from trees over 400 years old and was probably harvested by the early 1930s. 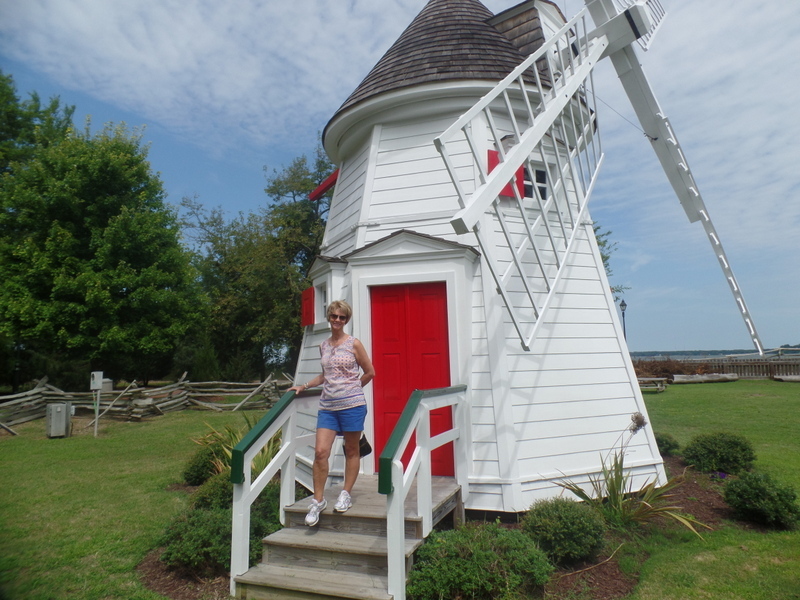 We wandered around outside for a bit walking over to the Yorktown Windmill next door. The doors on either side were locked so we just walked around. Again, Jerry was amazed at the railings. It is amazing to notice the different things we point out as we tour. He really makes me see things in a different light. When we entered we decided to go on and buy the pass to the National Parks. It’s only $10 and good for nearly all of the national parks. Our first stop was a 15-minute orientation film, entitled “The Siege at Yorktown”. It’s always humbling to watch things like this as we remember the many lives that were either ended or dramatically changed yet we take so much for granted. We then took a 55 minute “tour” behind the center led by a very well informed and entertaining park ranger. Again, a humbling experience to realize that we were standing on the very ground where battles occurred. We looked out over the fields and one could almost imagine the soldiers marching along. Of course one of the leading forces was Lafayette and the amazing thing to me was that he entered the war at only 19 years old and was only 22 by the time of the Battle at Yorktown. I realize that 22 year old men were much different then but still… There is also a car tour of the Battlefield but by the time we got back to the River Walk it was 3:00 and we were hungry. After looking at a couple of the restaurants we decided to go on back to the RV to eat. In the meantime though we had to locate a gas station. I looked up stations on my gas buddy app and there was a Hess only 2 miles away so off we went. 22 miles later we found it! Gas and a little snack and we were on our way back to the rig where we spent a quiet evening getting rested for a day at Bush Gardens! Sunday, we returned to Yorktown and decided to visit Yorktown Victory Center. We bought tickets for both Yorktown and Jamestown thinking we would have time to do both. The museum itself was very interesting as the American Revolution is chronicled through exhibits, film and a timeline. Outside is a re-created Continental Army encampment. While there we got to see a demonstration of the musket firing as they showed how to properly load and fire a Brown Bess musket. It takes about 15 seconds to reload one and of course that is valuable time so the troops fire at different intervals so someone is always firing while others are reloading. 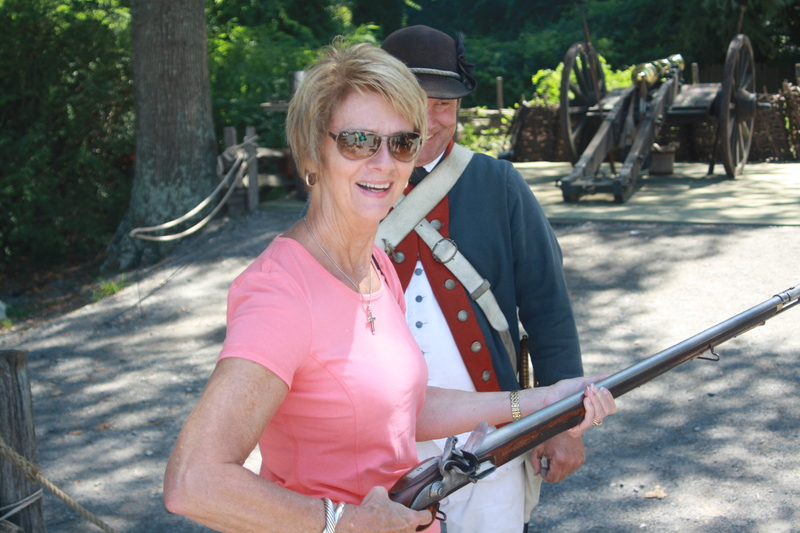 The gun only weighs about 10 pounds but when I held it it felt much heavier. We also saw them load a cannon and then fire it. We were cautioned to cover our ears and that was good advice! We also heard a “doctor” speak about the various treatments the soldiers received. Interestingly enough doctors did not have to go to school to become a doctor. They apprentice a doctor and then when the doctor felt the apprentice was knowledgeable enough and capable he was pronounced a doctor! Kind of scary. We wandered through the smoke house where someone was cooking a pot roast in a Dutch oven over an open fire. He had earlier prepared cornbread in a smaller Dutch oven. After wandering around for a while we went back to the car and drove back into Yorktown to drive through the Yorktown Battlefield where we could see the siege lines and the encampments. Along the way we saw a doe and two fawn. From our reaction, one would think we had never seen deer before. By their reaction you’d think they saw people quite frequently. We drove by twice and were able to roll down the window and get a couple of pictures. Obviously there is little hunting going on there as they are not afraid at all. We drove by the Moore House, the site of the negotiations that led to the British surrender but we didn’t go in. Our next stop through the winding roads of Virginia and the Colonial Parkway was the Jamestown Settlement. When we got to the admission desk the lady told us that the museum closed at 5:00 and it was already after 4:00. She indicated that the tickets were good for a year and perhaps we’d like to come back later. Not knowing if we’d ever come back to Williamsburg we debated about going on in but decided not to. As we were driving back to the campground I suggested getting up early on Monday, breaking camp and then driving the coach to Jamestown. Jerry is anxious to get home so he can get to the river to finish Emma’s bookcase for her birthday but he agreed that it would be wiser to visit tomorrow. Who knows when we’ll be back? We went on back to the campground after making a stop at the grocery store for steaks and potatoes. When we got back I immediately started watching the Saturday night show of the World’s Championship. Jerry put the potatoes on and discovered that it doesn’t take as long to cook them in a convection oven! We nuked a couple of potatoes, had a delicious dinner and then went for a short walk.